Made to be the most reliable tools in the market today，Tool solutions for most all situations. For deglazing engine cylinders 2-Inch to 7-Inch in diameter. Knurled wheel adjusts spring pressure of stones against cylinder bore. Set screw and adjustable collar allow setting hone to 2 different maximum diameters for easier handling. Hone features 3 replaceable 4-Inch long 220 grit stones. 1. Spray Lubricant On The Stones Or The Cylinder Bores. Get The Hone Set Up On The Drill. 2. Insert The Engine Hone Into The Cylinder And Run The Drill At Low Speed Between 300-700 RPM. Move The Hone Up And Down Around Once A Second. 3. After Honing, Use A Paper Towel To Wipe Out The Inside Of Cylinder. ▲Don't Push Or Pull The Stones More Than 3/4 Inch Out Of The Cylinder. Don't Run The Engine Hone For More Than 3 Mins. ▲This product and its packaging contain a chemical known to the state of california to cause cancer,birth defects,or other reprouctive harm. ▲Wear safety glasses when using tools. FLEXIBLE SHAFT - Flexible Shaft For Easy Use And Self Centering Knurled Nut Controls Honing Tension 3/4'',Through 2-1/2'' Range ,Remove Glaze And Scratches From Engine Cylinders. TIME TO REFRESH - Removes Carbon, Rust And Heat Glaze Deposits On Cylinder Bores, Which May Cause Low Cylinder Pressure And Affect Engine Start-Up. 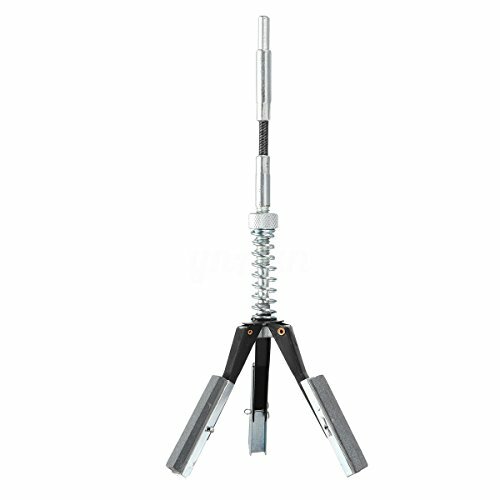 EASY TO USE - Flexible Shaft And Spring-Loaded Legs Provide Simple Operation, Can Be Used On Or Off The Car With Any Drills. If you have any questions about this product by Dracrys, contact us by completing and submitting the form below. If you are looking for a specif part number, please include it with your message.